See reviews on some of the products we at Practical Preppers believe are best in class and, in many cases, essential to your prepper plan. This is a product review for a handy tool kit. I used it on 2 of my latest projects and it is a keeper. Everyday preparedness brings peace of mind in the face of unforeseen emergencies. In these situations, you simply can't beat the 1600. This all-stainless-steel distiller has no moving parts, delivers up to 16 gallons a day of pure, safe water—almost silently—with or without electricity. The two modular parts are pre-assembled, so set-up is a breeze. A countdown digital timer is included for trouble-free monitoring. The simple robust design using quality materials and workmanship guarantees a long and effective service life. The body is cast iron, the wing with valve set, and the vee valve are brass and the shaft is steel. 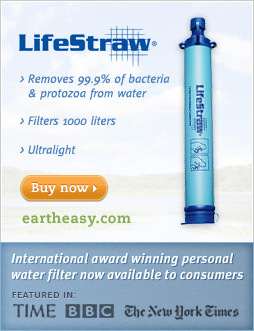 LifeStraw is the award-winning personal water filter, designed to provide you with safe, clean drinking water in any situation. The ideal water filter for hiking & camping, travel, emergency preparedness & survival, LifeStraw makes contaminated or suspect water safe to drink.